On January 19 in Toronto, a local fan favourite of Vancouver’s music scene was awarded as Canada’s Best Harmonica Player of the Year. 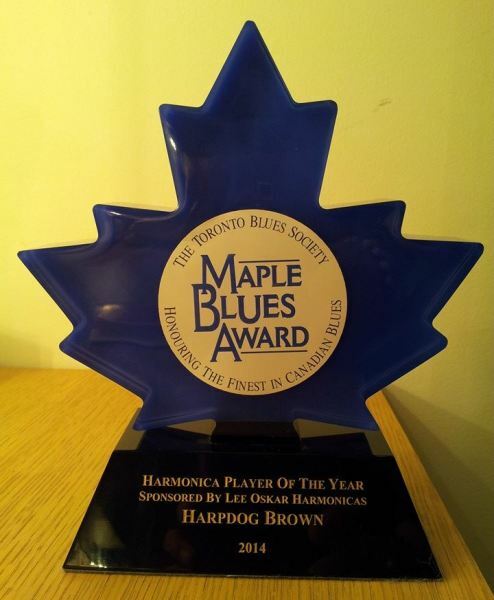 Harpdog Brown attended and performed at the 18th annual Maple Blues Award ceremony, which took place in Koerner’s Hall, located inside the Royal Conservatory of Music’s TELUS Centre For The Performing Arts. Harpdog has been a familiar stage musician in Vancouver for over 20 years. His larger than life stature, energetic presence on stage and authentic blues sound make him a very popular act in and around Vancouver. Harpdog Brown (yes, that’s his real name) was born in Edmonton, Alberta but has long since made Vancouver his home. Earlier this week, he traveled to Toronto to dig up what he knew rightfully belonged to him. Not only did he take home the award for best harmonica player of the year, but he also performed for the crowd. Harpdog was one of eight acts selected to perform one of their hits at the award ceremony, and we have no doubt he loved every minute of it. This legendary blues player will be returning to Vancouver this weekend to perform at Caffe Roma & Lounge on Commercial drive on January 24. For more shows and information about Canada’s Best Harmonica Player, visit www.HarpdogBrown.com.